Draped Bust Quarter - First ever Quarters made at the U.S. Mint. Draped Bust Quarter - First quarters made at the U.S. Mint. 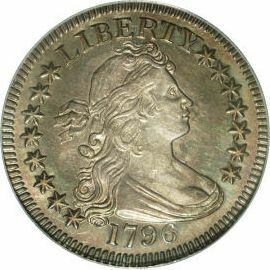 The Draped Bust Quarter of 1796 was authorized through Congress by the mint Act of 1792. It is a one year type coin which makes it very sought after by collectors of type sets. Whether you have a specialized quarter coin collection or a complete type set of U.S. coins, this coin is needed to round out your collection. This particular coin is not especially rare but the ratio of buyers to coins means higher prices for the most part. like all other draped bust coins, features Gilbert Stuart's portrait of Mrs. William Bingham. The portrait was surrounded by 15-6 pointed stars. It also has LIBERTY inscribed above and the date below the portrait. 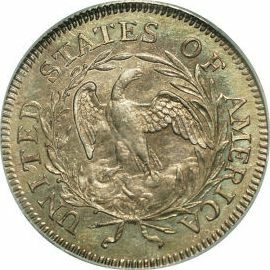 The reverse has a small eagle perched in the clouds surrounded by a wreath of olive and palm branches. It also has the inscription UNITED STATES OF AMERICA around the wreath.